Featured Home in Clarke Pointe Subdivision in Crestwood, KY! Our featured property this week is 3913 Clarke Pointe Court in Crestwood, KY! 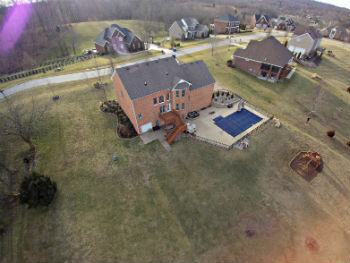 Located in a quiet subdivision in Clarke Pointe Estates in award-winning Oldham County School District. The views from the back of the house are breathtaking! I don’t feel like I am right on top of the other houses. 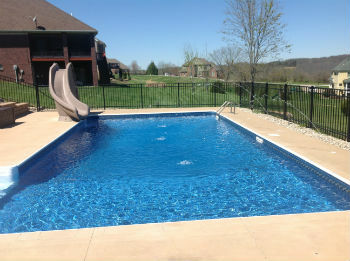 The in-ground pool is gorgeous with plenty of space to entertain! The inside of the house doesn’t disappoint either. With two master suites, 5 spacious bedrooms, a beautiful kitchen and a finished walkout basement, this house has a plethora of space for family and friends! One of my favorite features is the laundry room because there is enough space to sort and fold. I also enjoy the utility garage in the basement to easily access the lawn mower and other tools. Additionally, the basement walks right out to the pool. So if you are having a pool party and want to take a breather from the crowd, you can easily transition into the basement and still be involved in the party. Build Your Own Stir Fry at Genghis Grill in Springhurst! I ventured over to Genghis Grill in Springhurst last week for lunch. Even though the restaurant was packed, I was pleasantly surprised that the atmosphere was relaxing and not hectic. First and foremost, I was greeted by the host and he asked if I had been there before. Since it was my first time, I was glad that he willingly walked me through the process. After being seated, my waitress came by quickly and also gave a brief synopsis of the process. And then the fun began—creating my own stir fry! I selected my bowl size and then added my ingredients from there. The small size, even though it doesn’t look like much, was actually enough for me. I started with selecting my protein. From chicken to steak and from crab to bacon, there are several options for protein and I could pile on as many as I wanted! Then I chose my seasoning, veggies and sauce. Let me tell you about the veggie selection! There were potatoes, water chestnuts, eggs, zucchini, spinach—really any veggie that you could every want. All of that was in my bowl at the beginning and then once I arrived at the grill, I had the option to add one of these sides—steamed rice, brown rice, fried rice, Udon noodles, spiral pasta, tortillas, cabbage.